Woodstock is 16 miles (26km) west of White River Junction, 140 miles (226km) northwest of Boston, and 98 miles (158km) southeast of Burlington. For more than a century, the resort community of Woodstock has been considered one of New England's most exquisite villages, and its attractiveness has benefited from the largess of some of the country's affluent citizens. Even the surrounding countryside is by and large unsullied--you simply can't drive to Woodstock on a route that isn't pastoral and scenic, putting one in mind of an earlier, slower-paced era. Few other New England villages can top Woodstock for sheer grace and elegance. The tidy downtown is compact and neat, populated largely by galleries and boutiques. The superb village green is surrounded by handsome homes, creating what amounts to a comprehensive review of architectural styles of the 19th and early 20th centuries. 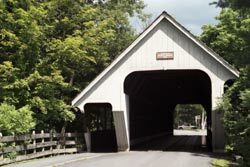 In addition to Woodstock, the region includes White River Junction and Norwich, two towns of distinctly different lineage located along the Connecticut River on the New Hampshire border. Woodstock--Much of the town is on the National Register of Historic Places, and the Rockefeller family has deeded 500 acres surrounding Mount Tom to the National Park Service. In fact, locals sometimes joke that downtown Woodstock itself could be renamed Rockefeller National Park, given the attention and cash the Rockefeller family have lavished on the town in the interest of preservation. (For starters, Rockefeller money built the faux-historic Woodstock Inn and paid to bury the unsightly utility lines around town.) Woodstock, on the banks of the gentle Ottauquechee River, was first settled in 1765, rose to some prominence as a publishing center in the mid-19th century (no fewer than five newspapers were published here in 1830), and began to attract wealthy families who summered here in the late 19th century. To this day, Woodstock feels as if it should have a prestigious prep school just off the green, and it comes as some surprise that it doesn't. A Vermont senator in the late 19th century noted that "the good people of Woodstock have less incentive than others to yearn for heaven," and that still applies today. Other wealthy summer rusticators were also instrumental in establishing and preserving the character of the village, and today the very wealthy have turned their attention to the handsome farms outside town. Few of these former dairy farms still produce milk; barns that haven't been converted into architectural showcase homes more than likely house valuable collections of cars or antiques. Woodstock is also notable as an historic center of winter outdoor recreation. The nation's first ski tow (a rope tow powered by an old Buick motor) was built in 1933 at the Woodstock Ski Hill near today's Suicide Six ski area. While no longer the skiing center of Vermont, Woodstock remains a worthy destination during the winter months for skating, cross-country skiing, and snowshoeing. One caveat: Woodstock's excellent state of preservation hasn't gone unnoticed, and it draws hordes of travelers. During the peak foliage season, the town green is perpetually obscured by tour buses slowly circling around it. The area's best cross-country skiing is at Woodstock Ski Touring Center (tel. 800/448-7900 or 802/457-6674), at the Woodstock Country Club, just south of town on Route 106. The center maintains 36 miles (58km) of trails, including 12 miles (19km) of trails groomed for skate skiing. And it's not all flat; the high and low points along the trail system vary by 750 feet in elevation. The ski center offers a lounge and restaurant, as well as a large health and fitness center accessible via ski trail. Lessons and picnic tours are available. The full-day trail fee is $12.50 for adults and $8.25 for children under 14. 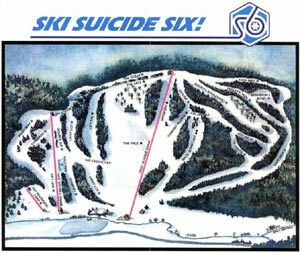 The ski area Suicide Six (tel. 802/457-6661) has an intimidating name, but at just 650 vertical feet, it doesn't pose much of a threat to either life or limb. Owned and operated by the Woodstock Inn, this venerable family-oriented ski resort (it first opened in 1934) has two double chairs, a complimentary J-bar for beginners, and a modern base lodge. Beginners, intermediates, and families with young children will be content here. Lift tickets are $44 for adults, $28 for seniors and children under 14. (Inn guests ski free midweek.) The ski area is located 2 miles (3km) north of Woodstock on Pomfret Road.